Tina Charles, Maya Moore and the latest Connecticut Huskies dynasty now have their own place in the record books. Charles scored 16 points and Moore added 11 to help top-ranked Connecticut win an NCAA record 71st straight game — a 59-44 victory over Notre Dame (No. 7 ESPN/USA Today, No. 6 AP) on Monday night in the semifinals of the Big East tournament. UConn surpassed its own mark set from Nov. 9, 2001, to March 11, 2003. Unlike that amazing run, which ended in a loss in the Big East conference tournament semifinals to Villanova, this Huskies team has thoroughly dominated its opponents in every game, winning all of them by double digits. Connecticut (32-0) will face either West Virginia or Rutgers on Tuesday night with a chance to win its 16th Big East conference tournament championship. Maybe the most spectacular aspect of UConn’s record is the fact they have seldom been behind in any of the 71 games. Has there ever been a more perfect sports team? Rutgers suspended Hall of Fame women’s basketball coach C. Vivian Stringer on Tuesday for one game for misusing practice players. Duncan Williams/Icon SMIC. 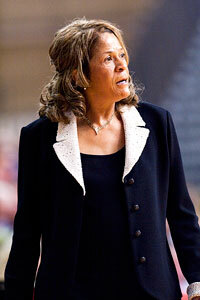 Vivian Stringer was found to have violated an NCAA bylaw that bars managers from participating as practice players. Rutgers has only nine players on its roster. Stringer will miss the Scarlet Knights’ game against Seton Hall on Wednesday. She is third among women’s coaches on the all-time victories list with 838 wins and was enshrined in the Naismith Memorial Basketball Hall of Fame last September. Stringer violated an NCAA bylaw which states that managers may not participate as practice players with the institution’s team if they are not eligible student-athletes. Associate head coach Carlene Mitchell will be the acting head coach against Seton Hall. Rutgers is down to nine players due to one player transferring away from the school. In my opinion a one-game suspension or a warning is enough punishment for this particular rules violation. South Florida football coach Jim Leavitt was fired Friday following an investigation of an allegation that he struck one of his players in the locker room. South Florida said the findings of its investigation into the alleged incident will be discussed at a 12:30 p.m. ET news conference. In its statement, the university did not mention Leavitt’s status as coach. A South Florida staff member told ESPN’s Joe Schad that a staff meeting has been called for noon ET, at which time the entire coaching staff will be officially fired. A meeting with the players is not expected. Leavitt has been under investigation by the university for allegedly grabbing and striking special teams player Joel Miller at halftime of a November game against Louisville. The allegations against Leavitt originally were made by Miller’s father, Paul, in an online report. Paul Miller has backtracked from original comments that alluded to contact Leavitt allegedly made with his son’s neck and face. Miller has since said Leavitt only grabbed his shoulder pads. Apparently the school is believing the first version of events. Honestly, I don’t understand why abuse of college athletes is even tolerated by society. What would lead to criminal charges if it happened outside the world of sports, or happened to young men and women just a few young years younger, would result in criminal charges for the abuser. Instead excuses are made and the victims get criticized. What is wrong with this picture? SYRACUSE, N.Y. – Ernie Davis never wore Nikes, until now. A new statue of the first black player to win the Heisman Trophy depicts him in modern-day football gear â€” including Nike cleats. The problem is that Davis led Syracuse to the national title in 1959 and won the Heisman two years later, before Nike was formed. The university unveiled the Davis statue last Saturday, a day after “The Express” â€” a movie about Davis’ life â€” had its world premiere at the Landmark Theatre in downtown Syracuse. The film opens nationwide in October. Call it an honest mistake by the sculptor, 82-year-old Bruno Lucchesi of New York City, who said he was asked to work off a picture of Davis. The school said it also sent him football gear. The statue has Davis wearing his famous No. 44 jersey, but “NIKE” is inscribed on the heel of each cleat, there’s a swoosh on his chest, and he’s holding a helmet much different from the one he wore. Accidents happen, but one question remains. Will any of Davis’ surviving family members(Ernie died of leukemia at age 23 in 1963) get royalties from Nike? I’m not sure if that’s a serious question or not. No. 18 South Florida is not only basking in the national spotlight, the Bulls are thriving in it. Matt Grothe upstaged West Virginia stars Pat White and Steve Slaton for the second straight year, leading rapidly rising USF to a 21-13 victory over the mistake-prone, fifth-ranked Mountaineers on Friday night. Although many will view the result as an upset, USF is not a stranger to taking down ranked opponents. The Bulls upset Louisville at home two years ago and knocked West Virginia out of contention for a BCS bowl berth with a 24-19 upset at Morgantown last November. They moved to the brink of cracking the Top 25 for the first time with a 26-23 overtime victory at Auburn earlier this month. In a season of stunning upsets, it may not even be surprising anymore. That’s especially true for a Florida team, where they seem to grow more top flight college football players than the other 49 states combined. 1. KANSAS: The Jayhawks’ nonconference schedule includes more cream puffs than your favorite bakery: Central Michigan, Division I-AA Southeastern Louisiana, Toledo and Florida International (all at home). Kansas doesn’t play Texas or Oklahoma in Big 12 Conference play, and the Jayhawks will face Nebraska in Lawrence, Kan., and Missouri in Kansas City. Hawaii 2. HAWAII: Warriors quarterback Colt Brennan won’t have many problems putting up Heisman Trophy-like numbers against Hawaii’s schedule. The Warriors play two nonconference games against Division I-AA teams Northern Colorado and Charleston Southern, along with a road game at UNLV and home game against Washington. The Warriors’ WAC schedule includes home games against Fresno State and Boise State and road games at San Jose State and Nevada. Arkansas 3. ARKANSAS: The Razorbacks’ slate is a perfect example of why SEC teams have a poor reputation when it comes to out-of-conference scheduling. The Hogs will get fat on a nonconference schedule that includes home games against Troy, North Texas, Division I-AA Tennessee-Chattanooga and Florida International. SEC road games at Alabama, Tennessee and LSU prevented this from being the country’s easiest schedule. Indiana 4. INDIANA: In a season in which the Hoosiers don’t play Big 10 heavyweights Michigan and Ohio State, they beefed up their nonconference schedule with the likes of Division I-AA Indiana State, Western Michigan, Akron and Ball State. Indiana plays rival Purdue and Penn State at home, but travels to Iowa and Wisconsin. Thanks to the soft schedule, look for the Hoosiers to play in a bowl game for the first time since 1993. Connecticut 5. CONNECTICUT: The Huskies might have put together a tougher schedule by returning to the Atlantic 10. Their nonconference schedule includes games against Division I-AA Maine and two of the worst I-A teams — Duke and Temple. The Huskies play seven of their 12 games at home, including key Big East dates against Louisville and Syracuse. Navy 6. NAVY: The Midshipmen play only four Division I-A teams that finished with winning records last season: Rutgers, Wake Forest, Notre Dame and Northern Illinois. Five of Navy’s 2007 opponents won four games or fewer last season, including Duke (0-12), Temple (1-11), North Texas (3-9), Army (3-9) and Air Force (3-8). Northwestern 7. NORTHWESTERN: The Wildcats could see a big turnaround in coach Pat Fitzgerald’s second season, thanks to a not-so-daunting schedule. Nonconference games against Division I-AA Northeastern, Nevada, Duke and Eastern Michigan (at Detroit) are potential victories. Home games against Minnesota and Indiana could bring the victory total to six, making Northwestern eligible for a bowl game. Texas Tech 8. TEXAS TECH: Give the Red Raiders some credit for scheduling a pair of nonconference road games â€¦ at SMU and Rice. A home game against UTEP might be challenging, but a Sept. 29 game against Division I-AA Northwestern State will be a rout. Texas Tech plays home games against two of the Big 12 conference’s most talented teams, Texas A&M and Oklahoma. Ohio State 9. OHIO STATE: The Buckeyes won’t miss Heisman Trophy winner Troy Smith and the rest of their departed stars during the nonconference schedule. Not against Division I-AA Youngstown State, Akron and Kent State, anyway. At least a Sept. 15 game at Washington will be played outside the state of Ohio. The Buckeyes play two of their most difficult Big 10 games on the road, at Penn State on Oct. 27 and at Michigan on Nov. 17. Texas 10. TEXAS: The Longhorns get kudos for scheduling a home game against TCU, a possible BCS sleeper. But the rest of the schedule sets up very well for coach Mack Brown. The other three nonconference games should be routs, against Arkansas State, Central Florida and Rice. The Longhorns play top Big 12 foes Nebraska and Texas Tech at home, along with the Red River Shootout against Oklahoma in Dallas. You can’t blame the athletic directors. It’s to each school’s benefit to play weak teams — so long as they don’t lose.